To explain what I mean, we'll have to go back to last year, around this time (well, actually, that's not entirely true, since spring didn't come in January last year), when we noticed a small nest beginning to form on our rain gutter. No matter, we thought, it's not doing any harm. Plus it would require a ladder to get to, which means we put it in the "someday we might fix that but probably never" category. But as it began to take shape, we soon realized that whenever we opened our door to leave our house or approached our house, we caught a glimpse of a robin flying away from us into a nearby tree. Every. Time. So we officially had a new roommate. This robin, whom I lovingly named Regina, ended up laying eggs in the nest which later hatched into baby birds. Real live baby birds. In our midst. I told this tale (complete with baby bird picture) on my tumblr blog last year, which you can read here. The baby birds quickly (by my standards) learned to take flight and we (read: I) were left with Regina-sized holes in our hearts. I was a little sad that I didn't get to know the babies a little better or get to see their first steps or teach them how to tweet the Final Countdown, but at least it put a stop to the minor heart attacks we were having upon hearing the rapid fluttering of wings every time we approached our doorway. This brings us to March 2012. The snow is melting... I mean, the frost is subsiding... I mean… Whatever, the weather's gone from "sort of chilly" to "pretty darn warm" now, so the robins have returned to our townhouse complex in droves. In recent days, that familiar, panicked flutter has come barreling back into our lives, and so have the minor heart attacks. Only this time, the bird has made its home in the porch light on the opposite side of the door, which means it cuts directly across the doorway to escape to the tree. Which means it narrowly misses my face. Every. Single. Time. Today when opening my door I saw not one, but TWO robins fly away from our house. So not only do we have a new nest, but the old nest has been re-inhabited by a robin apparently too lazy to build its own nest. Or either Regina just missed us and couldn't stay away. So now too much time has passed to evict them. I mean, there might be EGGS in there. You can't evict a mom and her babies. No one is that heartless. 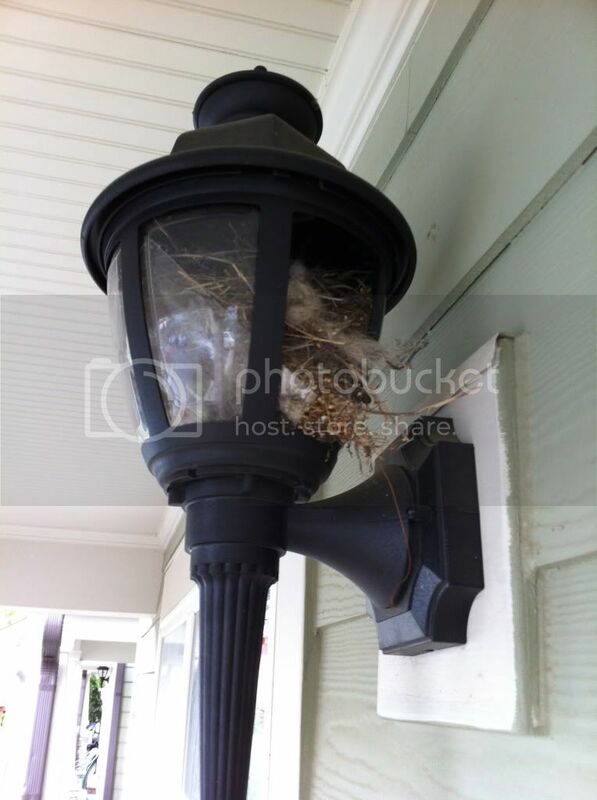 Plus, I've already named the new porch light bird Rosita. Whenever you name something, there's no going back. I suppose if Regina 2.0 is, in fact, a new bird, I should give her a name too, since she's obviously here to stay. But then again, if you're just going to hijack Regina's old nest and not put forth the effort to build a third nest on our porch, I'm not sure you deserve the honor of having me name you anyway. Sigh. So now we're the crazy people who have bird families living on our porch. We live in a townhouse complex. 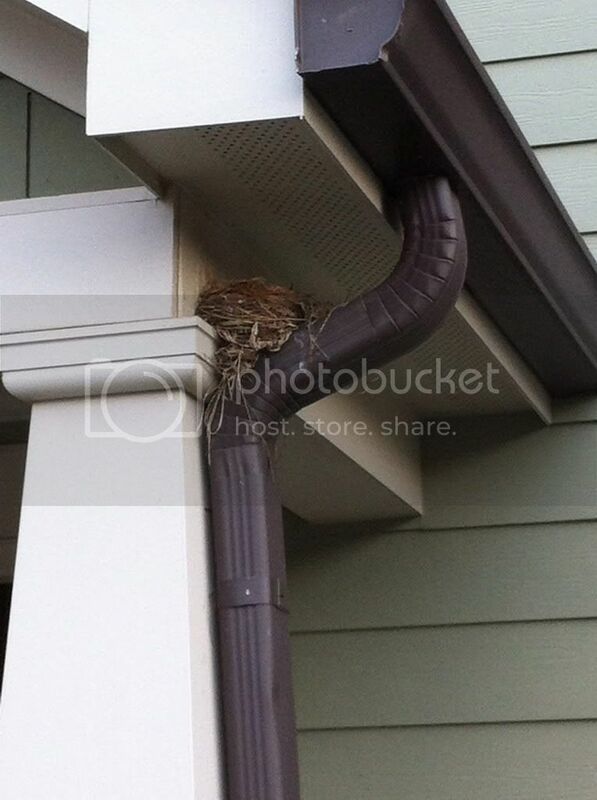 Do you know how many of our neighbors I've seen with bird nests on their gutters? NONE, that's how many. Probably because when they see a mound of pine straw and leaves in their porch light, they don't look at it with a mixture of disgust and laziness and keep walking, they roll up their sleeves and get that gross junk outta there. But then they don't get to witness the miracle of life either, so, it's kind of a lose-lose in my eyes. Have you ever allowed wildlife to dwell in or outside your house? What should I name Regina 2.0 (besides Regina 2.0)?